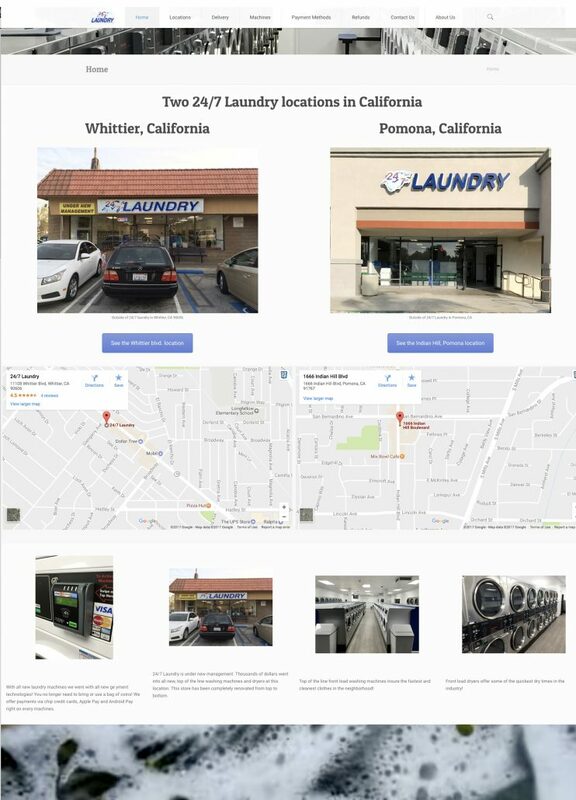 The young owner of this budding 24/7 Laundromat chain in Whittier and Pomona, California did his homework on CoinLaundry.org to find the best company to design a website for maximum searchability and for the maximum return on investment. Needless to say, he found Big Ten Web Design all the way in Iowa City. We are still working on his website as he continues to add location after location in California just east of Los Angeles. Our top goal was to verifying locations with Google & Bing and making the website search engine friendly. The competition in that area is immense with long established Laundromats only blocks away. Yet the services at this Laundromat are top of the line using smartphone payment options with apple and android pay. Plus, the machines are quicker and newer than any other competitors in the area. He has grown leaps and bounds from his first location and he keeps expanding his Laundromat empire. It is a total leap of faith to start multiple laundromats and contact a marketing company in Iowa City asking for them to get hundreds to flock to their soon to open laundromat. We are happy to announce that we didn’t disappoint. We were able to explain online to new clients why go with this new laundromat, with faster machines that can even take Apple and/or Android pay. No other local laundromat is taking mobile pay and the owners clientele is loving the convenience! We were able to create door hangers to help get the word out off-line. Not all of our marketing strategies are strictly online. We also provide print material for our clients for their grand opening.